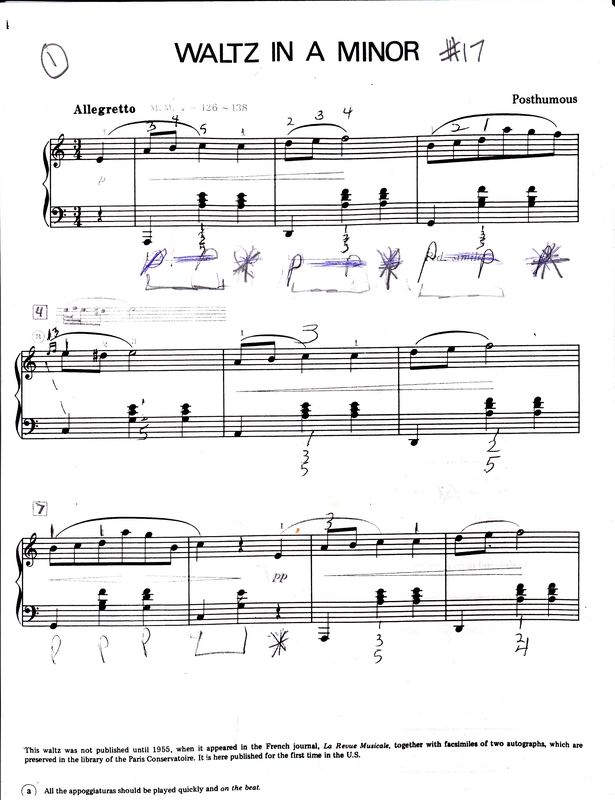 After decades of teaching the Chopin Waltzes, I’ve come to the conclusion that the A minor, No. 19, Op. Posthumous is the best student introduction to the form as the composer cultivated it. While many other Waltzes in Chopin’s collection are far more substantial and technically challenging, No. 19, is in my opinion, easiest to assimilate, study, and play. In part, it’s because the harmonic structure is very straightforward, leaning toward tonic, sub-dominant, and dominant chord relationships. In addition, a frequent interchange occurs between the tonic A Minor in which the piece is written and its relative C Major. (Good material for introductory theory) Finally, there’s an abundance of thematic repetition. The big climax of the piece, on the third page, (measures, 33-40) is a modulation to the Parallel A MAJOR, which makes a conspicuously audible impression. 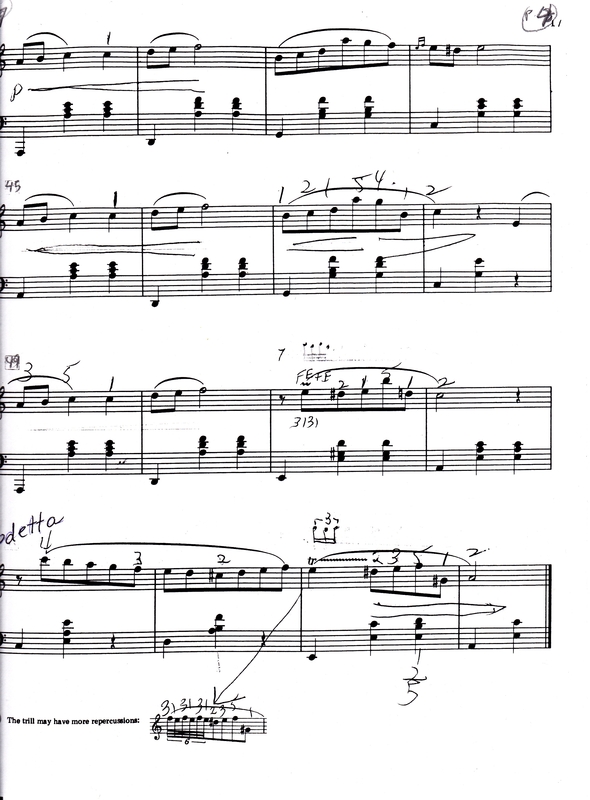 This section also has the most notes phrased at a Forte dynamic level. 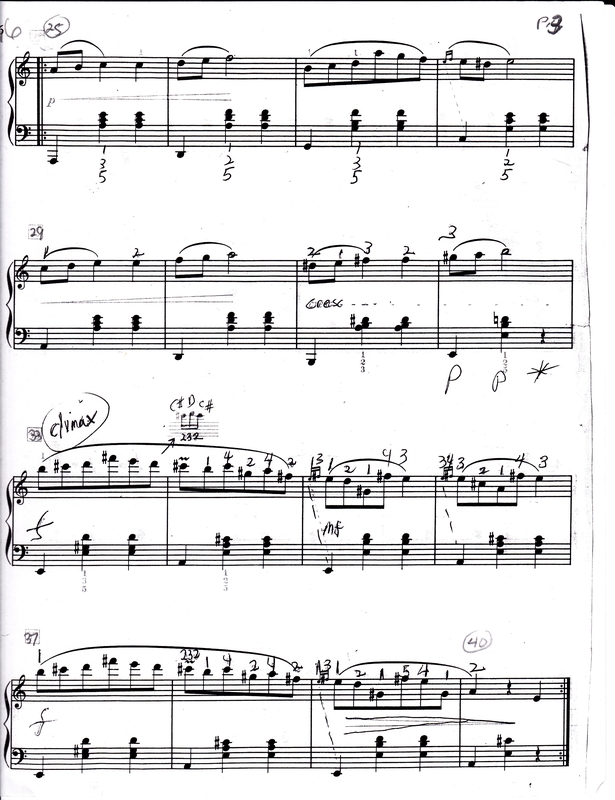 Following the composition’s peak, the composer returns to the opening theme, which is in the home key of A minor. 1) First, trace the path of melody through the opening section, (measures 1-16) in SLOW motion, following the phrasing very carefully. Chopin was very much a molto cantabile composer, who stressed the singing tone capability of the piano. In this first section, the composer offers the preponderance of material for the complete Waltz. Note that ornaments are played on the beat and with good directions in the editor’s annotations. 2) Continue by separately practicing the fundamental bass of the first section. (only the first beat of each measure, known as a “downbeat”) Draw each one out with a deep, resonant stroke. 4) Next play the downbeats followed by the after beat chords in each measure. Draw out the downbeats without poking at them. You want a rich bass, not an accented one. The after beat chords should be lighter, as previously mentioned. 5) Finally, put hands together for the first section. The melody should be very singable and prominent. The fundamental bass gives the ground energy; the after beat chords fill in with colorful harmony. The balance between the melody, fundamental bass, and after beat chords is very important. The same advice for part one applies here. Keep to the order of practicing separate hands, with an awareness of balance between right hand and left hand. Notice that this part of the composition is more extemporaneous, and feels improvised. It begins in the Melodic form of A minor and lets go with a DOMINANT key arpeggio (E Major) If you’ve been conscientious about practicing arpeggios, this passage should not be too difficult to execute, but consider it a freely rendered figure and not meant to sound forced, regimented, or robotically played. Remember that the Romantic style is characterized by a sense of freedom and improvisation. Follow the method of practicing separate hands, as introduced in the beginning of the work. 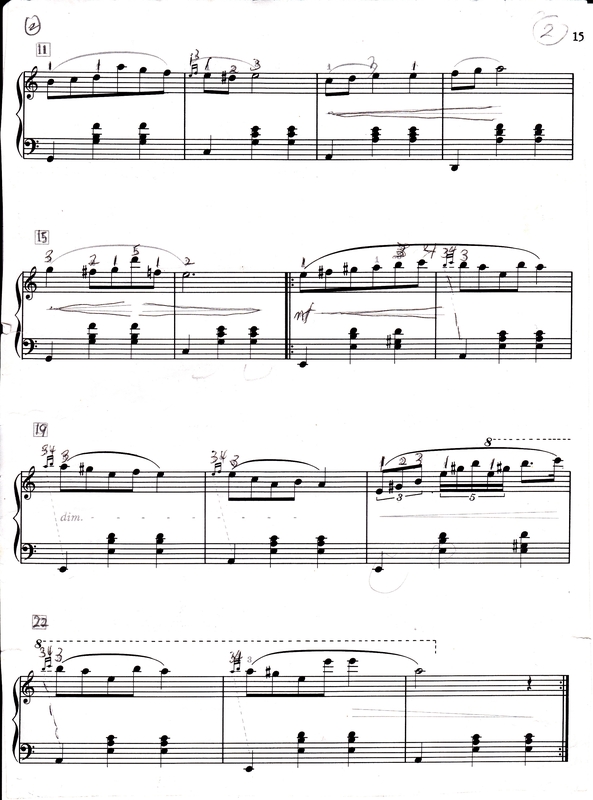 The Climax: Measures 33-40 The longest phrasing in the piece and in A MAJOR (The Parallel MAJOR) with a Forte dynamic. Practice with the same parceled out approach as the beginning. Finally the opening section returns in Measures 41 to 52 with a Codetta (small, modified ending) as the last line. Next postA Performance I’ll Never Forget! Hello from Madrid. I am following your practice suggestions for this piece, where I have reached a stagnant point. Thanks a lot for your tips on how to play a rich yet subdued bass line. Best wishes!